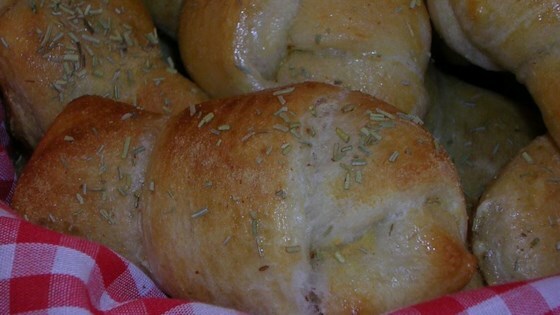 "So simple and quick to make, these delicious knots of herb-seasoned bread will do well to complete just about any meal. Or eat these tasty knots as a snack between meals, with your favorite spread slathered on! Using fresh rosemary makes these knots especially fragrant." Garlicky-good and temptingly soft appetizers! Meh. Didn't have any garlic taste, only slight rosemary taste. Recipe needs tweaking, like others have said. Someone who figures out the combination, post it! Fragrant indeed, Sandy. There were outstanding. I made them with my own homemade herb bread and increased the garlic powder to 2t and used some dry rosemary, too. Thnaks for a keeper. The family went wild!, I minced fresh garlic and oregano in melted butter and brushed periodically during the baking. the garlic browned along with the knots. Super simple!! I used a garlic butter spread that I get from our local deli and omitted the egg wash. My whole family gobbled these up!! Thanks for a great recipe! These came out great. The only difference I did was I added Pecorino cheese on top. It gave it a great taste. I did omit the Rosemary but I'm pretty sure It would taste great w/ it also. Yummy! Very easy and they smell great while cooking. They turn out very pretty as well.